Below is an extract from ASPI’s forthcoming publication Strike from the air: the first 100 days of the campaign against ISIL. Click here  to register for the publication’s free launch event. The international coalition has managed to degrade but not destroy the Islamic State of Iraq and the Levant (ISIL) through an air campaign that has involved around 1,000 strikes in the first 100 days of the operation. 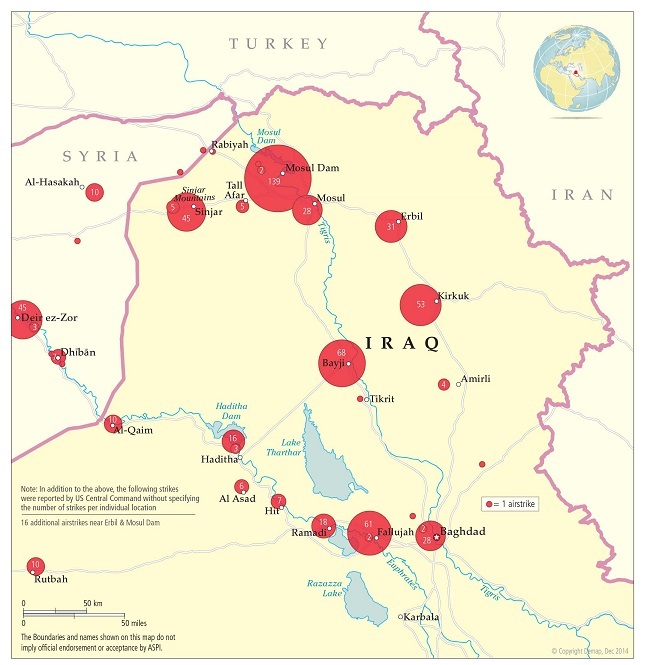 In Iraq, the strikes have partially but by no means completely contained ISIL. Much of the forward momentum of ISIL operations against the Kurds in the north, around Baghdad and in Anbar Province seemed to slow towards the end of September. ISIL has no longer been able to move in formations of military vehicles because they can be identified and hit from the air. That has limited its capacity for conventional military manoeuvres. ISIL responded to the air campaign by changing tactics. Large convoys flying ISIL flags, which were seen in June and July, have ceased. ISIL has clearly worked hard to disguise leadership movements. A rare break in its operational security allowed coalition forces to attack a house in the western Iraqi border town of al-Qaim, where it was understood that a leadership meeting was taking place, on 7 November. Reports  that ISIL leader Abu Bakr al-Baghdadi was wounded in the strike appear to have been disproved by the subsequent release of an audio recording of the leader. It’s clear that US rules of engagement place considerably more restrictions on the use of airstrikes than was the case during the 2003 invasion of Iraq. Over the first 100 days, the vast majority of strikes in Iraq were against clearly identified military targets, often single vehicles or guard posts. Mosul, where significant numbers of ISIL fighters are located, has been off limits. For the coalition, this has had the benefit of significantly reducing claims that it’s been killing civilians. Narrow rules of engagement have also constrained the coalition in targeting ISIL leaders. Many strikes have had only limited tactical effect. With its options for quasi-conventional military tactics constrained, ISIL returned to more traditional insurgency tactics. A number of towns and villages in Anbar Province have been infiltrated by ISIL fighters undetected by coalition aircraft. ISIL is reported to have built up strength at Abu Ghraib, 40 kilometres northwest of Baghdad and within shelling distance of the city’s international airport. ISIL has previous history  in the area: it staged an attack on the Abu Ghraib prison in July 2013, freeing more than 500 people. There’s considerable local Sunni sympathy for the group at Abu Ghraib and throughout Anbar Province. ISIL has also been able to stage regular bomb attacks (see here , here  and here ) in Baghdad over the past few months. The continuation of this violence shows that ISIL and its supporters have comparatively easy freedom of movement around central Iraq. On 19 August, following some days of US airstrikes, Iraqi military and Kurdish Peshmerga fighters retook the strategically important Mosul Dam , which had been captured by ISIL several weeks earlier. Reinforced with US advisers and coalition airdrops of weapons, the Peshmerga seemed able to hold ISIL at bay in the north of Iraq. In the centre of the country, fighting between Iraqi forces, Sunni militias of unclear pedigree and ISIL produced more mixed results, but the coalition’s sustained pressure on ISIL seemed to be turning a corner from late October. In mid-November, it looked as though  Iraqi forces were gaining control of critical assets in the town of Bayji, close to Iraq’s biggest oil refinery, where a hard-pressed Iraqi military unit had been under siege by ISIL for five months. As was the case with the campaign in Iraq in 2007—the time of the Petraeus ‘surge’ —a critical factor for success in Iraq remains the willingness of Sunni tribal leaders in Anbar Province to work with the Iraqi Government against terrorist forces. There’s little sign at this stage of an ‘Anbar awakening’ like the one in 2007, when the Sunni tribes decided that they’d had enough of the brutal behaviour of al-Qaeda in Iraq. ISIL is a significantly more capable force and even more intimidating than its al-Qaeda predecessors. The Iraqi military’s progress (or lack of it) in Anbar will be a defining factor in the progress of the war in 2015.